1. 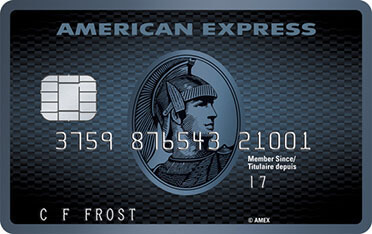 You can earn Membership Rewards points for eligible consumer purchases at American Express retail merchants as follows: 5 points for every $1 at or for (i) restaurant, quick service restaurant, coffee shop and drinking establishments in Canada, (ii) stand-alone grocery stores in Canada, (iii) delivery of food and groceries in Canada as a primary business; and 2 points for every $1 at or for (i) stand-alone automobile gasoline stations in Canada, (ii) travel services or travel bookings including air, water, rail and road transport, lodging and tour operator sales, (iii) local commuter transportation in Canada including subway, streetcar, taxi, limousine and ride sharing services. Purchases at merchants where these categories are not their primary business such as general merchandise retailers do not qualify. Merchants are typically assigned codes and categorized based on what they sell. Earn rate of 1 point for every $1 applies when the merchant code is not in an eligible category, using a payment account or service of a third party, a card reader attached to a mobile phone or online retailer that sells goods of other merchants or the merchant category is otherwise not identified. Provided your account is in good standing, points can be earned on eligible purchases less returns and other credits. Interest, fees and charges for travelers cheques and foreign currencies are not purchases and do not earn points. 2. This offer is only available to new American Express Cobalt Cardmembers. For current or former American Express Cobalt Cardmembers, we may approve your application, but you will not be eligible for the Membership Rewards points offers available in the first 12 months of Cardmembership. Offer subject to change. To qualify, you must have at least $500 in net purchases posted to your account by the last day of each billing period. Purchases made during a billing period but posted after the end of that billing period may not count towards eligible spend for that month. If this occurs, that purchase will count towards eligible spend for the next billing period. For example, if your monthly billing period is from Aug 15 to Sept 14, a purchase made on Sept 14th (transaction date) and posts on Sept 15th (posting date) may not count for eligible spend for that month. In this case, that purchase will count towards spend in the next month's billing period. If the Aug 15 to Sept 14 period was your 12th monthly billing period, then the purchase made on Sept 14 and posting on Sept 15 would not count toward this offer. Account must be in good standing. Please allow up to eight weeks for your bonus points to be awarded. 3. Fixed Points Travel Program - You can redeem a fixed number of points to cover the base ticket price of eligible flights up to the applicable maximum base ticket price. The base ticket price (often referred to by airlines as the base fare) excludes taxes, fees and carrier surcharges. You will be charged for these additional costs and any dollar amount that exceeds the applicable maximum base ticket price. The Fixed Points Travel Program applies to airfares offered through American Express Travel Services Canada or on americanexpress.ca/travel. When you redeem points for an eligible flight, the full cost of the flight, including taxes, fees and carrier surcharges will be charged to your Card upon booking. Within 5-10 business days from the date of booking, you will receive a statement credit for the base ticket price up to the applicable maximum base ticket price. If your statement monthly cycle cut date falls between the date the transaction is recorded on your statement and the date the statement credit is processed, you will be responsible for paying your monthly statement in full. The statement credit will be applied against your next statement. Full terms and conditions for the Fixed Points Travel Program can be found at americanexpress.ca/fixedpointstravel. To use your MR Points to purchase eligible items at Amazon.ca, your eligible Membership Rewards program account ('MR Points Account') must be linked to your Amazon.ca account through the enrollment process. We reserve the right to restrict your use of Shop with Points or to un-enroll your MR Points Account by de-linking it from your Amazon.ca account at any time in our sole discretion, including when we suspect misuse or fraud. You agree that Amazon.com.ca, Inc. and its affiliates (collectively, 'Amazon') may share information that you have provided to Amazon with Amex Bank of Canada and its affiliates (collectively, 'Amex'). Amex may share information with Amazon regarding your Membership Rewards points account for the sole purpose of managing and facilitating the Shop with Points program using membership rewards points. This information sharing allows us to link your Amazon.ca account to your MR Points Account and, once enrolled, Amex may provide Amazon with information about your MR Points Account, including your total MR Points balance. We may also share information that you have provided to Amazon with Amex so that Amex can perform its functions with respect to the Shop with Points program, including processing payments made with MR Points. Neither Amazon or Amex will use information provided to it by the other party in support of the Shop with Points program for any purpose other than as expressly set forth in this paragraph. Certain items at Amazon.ca are not eligible for purchase using MR Points, and these items may change at any time. MR Points may not be used when making purchases with 1-Click. If you do not have enough MR Points to pay for your eligible purchase, you can pay for the remainder with the Amex credit or charge card linked to your MR Points Account, or an Amazon.ca Gift Certificate. Your MR Points balance will typically be reduced to reflect the amount of your purchase at the time of your order, but in some cases it may not reflect your use of MR Points for pending purchase transactions until the purchase has shipped or otherwise been fulfilled. It is your responsibility to ensure that you have enough MR Points in your MR Points Account at the time your MR Points are ultimately redeemed. If you don't have enough MR points remaining in your MR Points account at the time they are to be redeemed, you will be required to authorize another payment method. Your Amex credit or charge card will not be charged automatically. MR Points may not currently be combined with other rewards programs to make eligible purchases using Shop with Points at Amazon.ca. Returns are subject to Amazon's returns policy. If Amazon accepts a return for an item you purchased using only MR Points, those MR Points will be credited to your Points Account. If Amazon accepts a return for an item you purchased using MR Points and another payment method, Amazon may, in its sole discretion, credit the return to the other payment method before crediting MR Points to your MR Points Account. This is different from the order in which payment methods (MR points, Amex credit and charge card and stored value card) are applied at the time of purchase. See ordering section of the FAQ for details. If you no longer have an active MR points account or, if applicable, Amex credit or charge card, Amazon may process your return by providing you with an Amazon gift card. If you have questions regarding your Points or your Points Account, please contact American Express on the number listed on the back of your Card. 5. Use Points for Purchases - You can redeem Membership Rewards points for a statement credit towards an Eligible Purchase charged to an Eligible Card. You must redeem a minimum of 1,000 Points per redemption. Redemption rates may vary by Eligible Card. Statement credits on your Card Account should not exceed the aggregate amount of the Eligible Purchase(s) on your Eligible Card. If an otherwise Eligible Purchase participates in the American Express Installment Program, only the amount billed each month will be counted as an Eligible Purchase. You can register for online services to view your Eligible Purchases and to redeem online. Only Eligible Purchases posted to your Card Account during the last 3 months, up to 150 most recent Eligible Purchases will be displayed for redemption. If you wish to redeem points towards an Eligible Purchase within the last 12 months that is not displayed online, please contact us at the number listed on the back of your Card. Eligible Travel Purchases: 1000 points= $10 statement credit. All other eligible purchases: 1000 points=$7 statement credit. - Your American Express Card account will be charged for that day's purchase. If you qualify, American Express will debit Membership Rewards points from your program account and issue a credit for the corresponding dollar amount to the Card account charged for your ticket purchase. Credits may not appear during the same billing period as the charge for your ticket purchase. If the points redeemed do not cover the entire amount of the charge for your ticket purchase, the charge for the balance of the purchase will remain on your Card account. Ticket purchases failing to qualify for Membership Rewards point redemption will remain charged to your American Express Card account and are subject to the venue's and Ticketmaster's no refund/no exchange policy. 7. Flexible Points Travel Program - Membership Rewards points are accepted as payment for a wide range of travel options through American Express Travel Services. Membership Rewards points can be used to pay for new travel purchases, including taxes and surcharges. Membership Rewards points are not refundable. Membership Rewards points have no cash value. Travel selections are based on available space and are subject to terms and conditions of travel suppliers. For car rental companies and hotels that do not accept prepaid bookings, contact American Express Travel Services at 1-800-611-1100 or (416) 868-4992 for details about how you can use your Membership Rewards points. In order to redeem points for any travel booking, the Membership Rewards Program account must be active and the Card must be in good standing. 8. Purchase must be charged in full to an American Express Card. Subject to availability and to event ticketing agent terms, conditions and fees. Not all seats are available. All sales are final. No refunds. No exchanges. 9. Subject to capacity. Admittance granted with an American Express Card. Beverages will be for purchase. Must be 19 years of age or older to have alcohol and must have a valid ID. Please drink responsibly. 10. Various offers will be available to Cobalt Cardmembers from time to time. These offers will be communicated by email and other select channels. Conditions apply and vary by offer. 11. Account must be in good standing. An additional card is a supplementary card. No annual fee for supplementary cards. Supplementary Cardmembers must be at least 13 years old. Maximum of 9 supplementary cards per account. 12. Underwritten by Royal & Sun Alliance Insurance Company of Canada. 13. Underwritten by Royal & Sun Alliance Insurance Company of Canada. Coverage is in effect as long as you have fully charged your rental to your American Express Cobalt Card. There are specific conditions that apply to who may rent and drive the rental vehicle, the length of rental(s) and the type of vehicle covered. 14. Travel Accident Insurance provides automatic coverage of up to $250,000 of Accidental Death and Dismemberment Insurance when you fully charge your common carrier (plane, train, ship or bus) tickets to your American Express Cobalt Card. Use the Card to book tickets for your spouse, dependent children (under 23) or any Supplementary Cardmember and they will also be covered. Spouse and dependent children (under 23) of Supplementary Cardmembers are also covered. Travel Accident Insurance is Underwritten by Chubb Life Insurance Company of Canada, Head Office in Canada: Toronto, Ontario, under Master Policy TMH600135. 15. Underwritten by Royal & Sun Alliance Insurance Company of Canada. Coverage is in excess of any and all other applicable insurance. 16. When you charge the full price on eligible purchases to your American Express Cobalt Card, the coverage given under the manufacturer's original warranty is automatically doubled for up to one additional year. Buyer's Assurance Protection Plan is underwritten by Royal & Sun Alliance Insurance Company of Canada. 17. Fraud Protection Guarantee - Use the American Express Card online or off, and you won't be held responsible for any fraudulent charges, as long as you've taken reasonable care to protect your account details and PIN. Notify us at once if your Card is lost or stolen, or you suspect it is being used without your permission. 18. All references to you means the Basic Cardmember. 19. Your account must be in good standing. If this is a personal or family referral, you agree to only make recommendations to known friends and family members with whom you have a relationship and who have confirmed to you that they want to receive this communication. If this is a referral in the context of your business, you agree to only make recommendations to business contacts whom you know and have consented to receive this recommendation from you. You must not send recommendations to people you do not know. Whenever you reach out to a potential referral, you will only use content we provide. Any additional statements you make cannot be inconsistent with our content and must be truthful, accurate and not misleading. You should not publish or distribute your referral link in locations where the audience is likely to include individuals with whom you do not have a business, personal or family relationship or who may not be interested in the offer. You can only receive a maximum referral bonus of 75,000 points per calendar year for approved referrals, which includes eligible referral bonus amounts from both (i) special or limited time referral offers and (ii) regular referral offers in that same calendar year. Bonus point maximums may change at any time and if you change card products. Should the referral bonus amount change during the calendar year, you may receive a partial bonus depending on the available maximum bonus points. You are not eligible to receive this referral bonus offer if you have already reached your maximum annual referral bonus limit. The referral bonus will be awarded to you based on each eligible referral for which American Express receives an application that is subsequently approved, subject to all applicable terms and conditions. Your referral bonus will be awarded in the calendar year in which the eligible referral application is approved and not when the referral application is received. Due to the confidential nature of the approval process, you will not be notified when applications are approved or declined and any individual you have referred must agree to allow your account to be bonused upon approval or you will not receive the referral bonus. If our records indicate that any person you have referred has opted not to receive e-mails from us, your referral will not be sent and you will not receive the referral bonus offered as part of this program. Referral program varies by product and may be modified, suspended, cancelled or otherwise terminated without notice. Cannot be combined with any other offer. If the people that you refer have already applied for the product that you are referring without participating in this program, neither you nor they will be eligible for any referral bonus that may be offered as part of this program. Likewise, if the people you refer decide to apply for a Card through this referral program other than the one you have specifically recommended, the referral bonus for which you and they may be eligible will vary. You will only use the delivery methods we provide. By participating in the referral program, you are requesting that emails be sent on your behalf to individuals with whom you have a business, personal or family relationship. Any violation or abuse of this referral program including, sending emails to individuals with whom you have no business, personal or family relationship, efforts to bypass, manipulate, obscure or otherwise modify the delivery and accurate presentation of the referral link, sharing tools, content, disclosures, instructions or other materials we provide will be considered a breach of these Terms and make you ineligible for any referral bonus and/or result in your termination from the program. Referral program participants should allow 8 to 10 weeks for the award of the referral bonus once program criteria have been met and must be enrolled in the corresponding loyalty program (if applicable) when the referral bonus is awarded. American Express reserves the right to limit, cancel, or revoke a referral or welcome bonus if it determines, in its sole discretion, you have violated these Terms. All products and services are subject to applicable Terms and Conditions. 20. Valid at participating hotels for bookings of at least two consecutive nights booked online through americanexpress.ca/travel or americanexpress.ca/thc. Available to Basic Cobalt Cardmembers. Supplementary Cobalt Cardmembers are not eligible for The Hotel Collection program. Payment must be made in full with an eligible American Express Card in the American Express Cobalt Basic Cardmember's name at time of checkout. The Cobalt Cardmember must travel on the itinerary booked. A one category room upgrade is based on availability and eligibility at check-in to the hotel. The Cardmember can receive a hotel credit upon checkout of up to $100 USD based on qualifying charges charged to the room excluding charges for cost of room, taxes, gratuities and fees. The $100 USD credit is non-refundable, and is not redeemable or exchangeable by the Eligible Cardmember for cash. Additional exclusions based on specific hotel restrictions may also apply (including without limitation, purchases within the hotel that are unaffiliated and/or owned by third parties) - see hotel front desk for details. Credit cannot be carried over to another stay and expires at check-out. Credit is applied in USD or equivalent in local currency based on exchange rate on day of check-out. May not be combined with other offers or programs unless indicated. Limit one credit per room, per stay. Three-room limit per Cardmember per stay; back-to-back stays within a 24-hour period at the same property considered one stay. Participating hotels and benefits subject to change. If you have one Missed Payment at any time after the first purchase eligible for the special interest rate is posted to your account, the special interest rate will be revoked "Missed Payment" means we did not receive the minimum monthly payment by the payment due date. Redeeming your points for things you actually want is very easy with this card. You can splurge on travel rewards or concert tickets, or simply put your points towards some retail therapy. Factor in a special low interest rate of 7.99% on purchases for the first six months**, plus extensive shopping and travel insurance coverage, and the American Express Cobalt™ Credit Card becomes an extremely desirable addition to any wallet. So, how does this stack up to other rewards points credit cards? We crunched the numbers using our Best of Finance methodology to see how much you could earn over a 24-month period. Put simply, this earning potential is hard to beat. The monthly fee looks to be a fair price for such a large return, and you are hardly restricted when it comes to redeeming points either. The 30,000-point bonus you get in the first year is already enough for a short-haul flight using the AMEX Fixed Points Travel Program. The annual fee is broken down into bite-size, monthly payments of $10. Earn two points for every $1 spent on eligible transit, gas and other travel purchases. The transit rewards are unusual and a big boost to urbanites who don't necessarily own a car or drive regularly1. Earn one point for every $1 spent everywhere else1. You get complete shopping flexibility! In your first year, you can earn an additional 2,500 Rewards points each month, as long as you make at least $500 in net purchases. This equates to 30,000 points over the course of a year! As a cardmember, you can refer a friend and earn a referral bonus of 5,000 bonus points, up to a maximum of 75,000 referral bonus points per year. With an American Express Cobalt™ Card you can redeem your points towards a whole raft of things, including streaming services, movie tickets, food and drink, retail purchases, travel rewards, concerts and events on Ticketmaster, gift cards, online shopping and more. No charge for additional cards. If you tend to carry a balance, enjoy a low interest rate of 7.99% on purchases charged to your card within the first six months of cardmembership** (provided you don't miss a payment completely). Cardmembers get access to advance movie screenings, and advance ticket sales to shows, concerts and other events through Front Of The Line® by American Express Invites®8. This card features a comprehensive insurance package. Coverage includes purchase protection, extended warranty and fraud protection. Travel-related insurance benefits include flight delay insurance†12, baggage delay insurance†12, hotel/motel burglary insurance†12, lost or stolen baggage insurance†12, car rental theft & damage insurance†13, and $250,000 travel accident insurance†14. While you do pay for the membership monthly, the annual total comes to $120, which may be a bit steep for some people. The interest rate is 19.99% for purchases and 22.99% for cash advances, but if you miss a payment, these rates increase to 23.99% and 26.99% respectively.